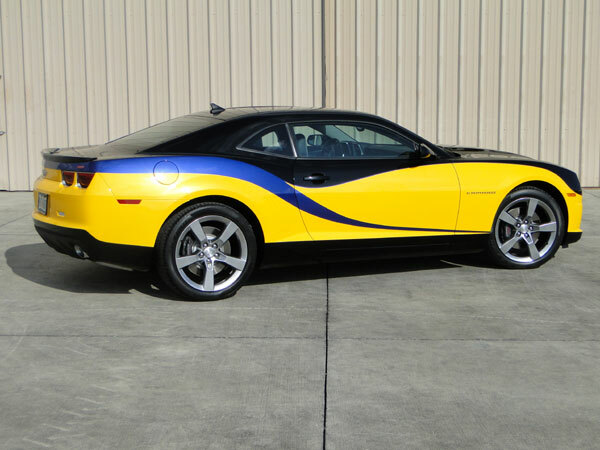 This New GM Muscle car owner wanted a Camaro with some exterior pop. This project was developed via a computer graphics design program prior to ordering the car. Ideas and colors were discussed using the computer with the owners while sitting around the table. Once all members in the family blended their ideas the final layout was developed. The car was ordered in the major base color, black. Sample colors of the yellow with gold pearl, indigo blue pearl and the ghost style carbon weave (in the blue) were sprayed out for final acceptance. Once the car was delivered the actual process of its new skin began. All surfaces were prepared for the custom paint work culminating with a beautiful glass finish. The car is out and around town and not easy to miss.